To install the WooCommerce Conversion Tracking FREE plugin, download the zip file from WordPress.org or directly from the website. Then navigate to wp-dashboard->Add New. Then click on Upload Plugin. 2. Click on Choose File, select the WC Conversion Tracking zip file from your folder. 3. Then click on Install Now. 4. Next, click on Activate Plugin. This will complete the installation and activation process. Alternatively, you can search and download the plugin directly from your WordPress dashboard. a) Go to wp-dashboard->Plugins->Add New. Then search & find WooCommerce Conversion Tracking from the search bar on the top right, as shown below. b) You will see the plugin in the results. Click on Install Now. This will complete the installation process of the Free version. 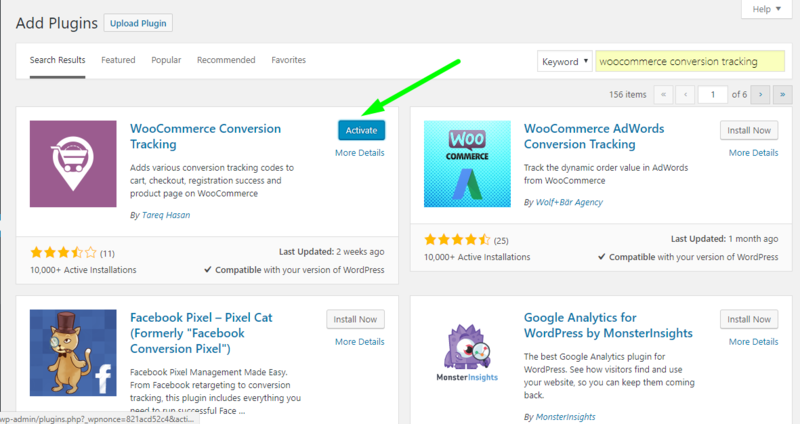 You can now view WooCommerce Conversion Tracking Free under your Plugins directory. After installation, view WooCommerce Conversion Tracking Free in wp-dashboard→WooCommerce→ Conversion Tracking. After purchasing, download the link from your My Account page. Then upload the zip file of the plugin from wp-dashboard→Plugins→Add New in the same way like you would with any other premium plugin. Click on Upload Plugin and select your zip file. 4. Click on Install Now to finish uploading. 5. 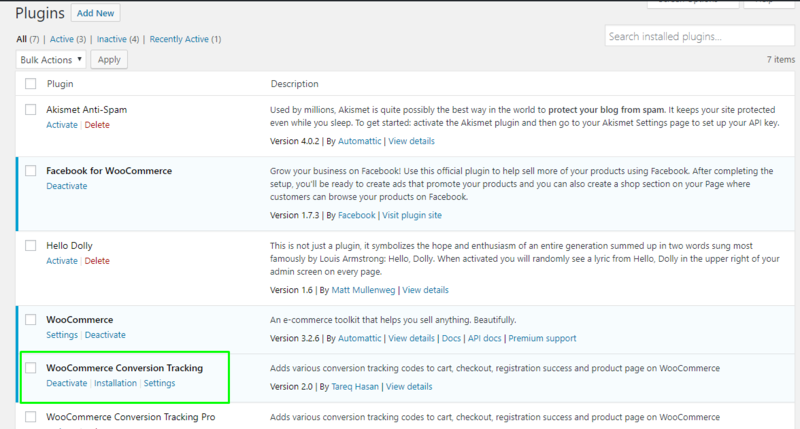 Then click on the Activate button located under WooCommerce Conversion Tracking Pro in the page Plugins→Installed Plugins. This completes the installation process of the Pro version. After installation, view WooCommerce Conversion Tracking PRO in wp-dashboard→WooCommerce→ Conversion Tracking.